Portland Experimental Theatre Ensemble: "Uncle Vanya"
THIS IS VANYA IN A SWEATY CABARET. This is Vanya in a brawl between love and redemption. This is Vanya just like any family get-together. Join us for the hangover after the holidays. by Ralph Huntley (Klezmocracy, Livewire), Andrei Temkin (Chervona), and Courtney Von Drehle (Three Leg Torso, Klezmocracy). This project continues our work on the series of new Chekhov translations that began with our production of The Three Sisters in 2014, and continues with our current work on The Seagull and Uncle Vanya. For our production of Uncle Vanya, PETE is thrilled to be collaborating with three incredible guest musicians: Courtney Von Drehle (Three Leg Torso, Klezmocracy), Ralph Huntley (Livewire, Klezmocracy) and Andre Temkin(Chervona). As composers, live musicians, and onstage characters, these three incredible artists are woven throughout our take on Uncle Vanya. Read on for a little more about each of our guest artists. About Courtney Von Drehle (Composer, Multi-instrumentalist, Performer) – Since 1980 Mr. Von Drehle has worked extensively as a composer, bandleader and multi-instrumentalist (Saxophones, Accordion, Guitar, Slide Guitar, Keyboards, Percussion). He has received numerous commissions for music to accompany film, commercials, radio, dance, theater, and performance projects. In 2003 he was awarded a fellowship at the Sundance Institute to participate in their film composers lab. His film scoring work has included working with filmmaker Irene Taylor Brodsky on her 2008 Academy Award nominated H.B.O. documentary The Final Inch, working with Academy Award winning animator Joan Gratz, and working with multiple award winning short film maker Chel White, amongst others. In addition to Mr. Von Drehle co-leading, composing and making orchestral arrangements for 3 LEG TORSO, he has been a member of the Afro-Hebrew ensemble KLEZMOCRACY, a resident composer for DOJUMP THEATER, and half of VONIGA, which received a 2010 Caldera Artist Residency Grant. Mr. Von Drehle’s accordion skills are in demand as a studio musician and he can be heard on the Disney show Jake and the Neverland Pirates, on the upcoming release of Nebraska, a film directed by Alexander Payne and scored by Mark Orton. Mr. Von Drehle has a B.A. in music from Marylhurst University and has studied North Indian classical singing. About Ralph Huntley (Piano, Accordion, Guitar, Percussion, Vocals, Composer) – Ralph Huntley is a 25+ year veteran of the Portland music and theater scene. He is a founding member and was musical director of the nationally syndicated public radio show Live Wire from 2003-2015. He has performed and/or recorded with Bill Frisell, Esperanza Spaulding, Alejandro Escovedo, Peter Buck (R.E.M. ), Scott McCoughey (R.E.M. ), Steve Berlin (Los Lobos), Willy Vlautin, Richmond Fontaine, Fernando Viciconte, and award-winning animator Chel White. He has composed music for and performed with NPR’s Marketplace, DoJump Theater (with whom he recently performed in New York on Broadway and in Washington D.C. at the Kennedy Center with his Klezmer-fusion band Klezmocracy), Powell’s Books, the Oregon Lottery, and Artist Repertory Theater. About Andre Temkin’s band Chervona: Chervona started practicing in 2006, and within weeks they were playing at “Gypsymania” – gypsy dance discotheque created by Gogol Bordello’s debaucher D.J. Dimon. In addition to countless street performances Chervona have played quite a few big stages, among them Slavic Festival, Oregon Country Fair, Red Marines Festival, April Fool’s Day Carnival, Revolution Party, Folk Life Festival, and special appearances with Manu Chao and Gogol Bordello. 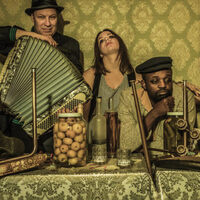 Mixing together taste and passion for the best Gypsy, Russian, Ukrainian, Klezmer and Balkan musical traditions, Chervona brings the fire of Eastern European carnivals to the land of America. *Uncle Vanya is made possible with support from the Oregon Community Foundation, The Miller Foundation, the Kinsman Foundation and Reed College.